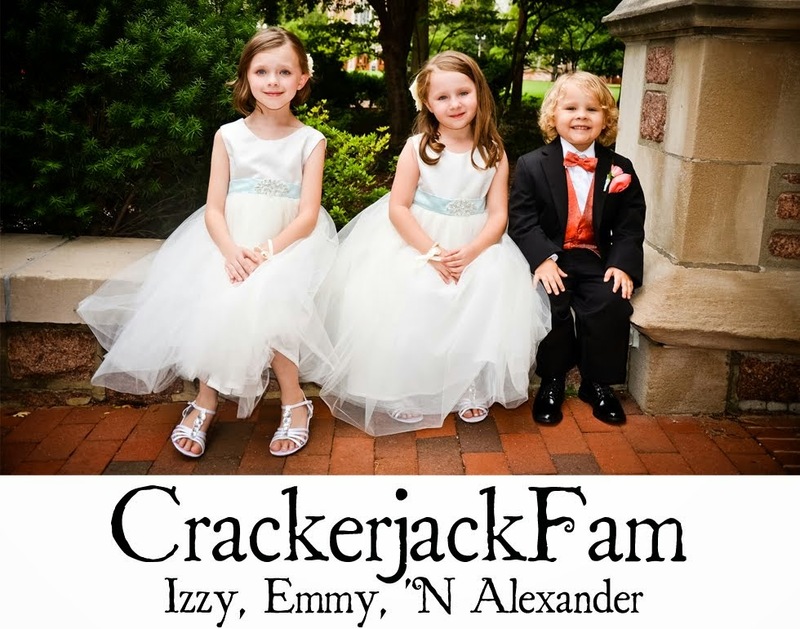 Izzy, Emmy 'N Alexander: PhotoStory Friday- Eat Cake! It is coming up on a week since Emily turned One. It's still hard to believe. I wanted to share the last of her birthday photos with you; The Cake! She loved it and it showed. "I'll start with a taste." "Ask Daddy to lick my fingers." "It's soo good! Thank you Mommy!" P.S. Happy Birthday to Nanny J (Dec 4th)!! We love and miss you and wish we could be there to celebrate with you! Don't forget to Enter my Christmas Giveaway! So cute!! My son just turned one last week too! We gave him a cupcake and he held on like someone might try to swipe it away from him! Happy birthday to your little one! THAT is exactly what a properly celebrated first birthday is supposed to look like! That first shot looks like she has OD'd on cake. Oh, those cheeks! I just want to smooch them. She is so adorable and those cake shots are classic! That last picture is to die for! Happy first birthday! awesome - love the joy on her face!! I love first birthday cake pictures - it hardly seems possible that it's been 5 years since Care Bear made such a mess - and we'll have a double mess in another month! Holy CRUMBS...those are the PERFECT first birthday shots!!! That's the way to celebrate! Great shots. And very smart of you to take of the clothes first! So sweet! I love these pictures and letting them get all messy! Thanks for stopping by and your comment on my post made me laugh out loud. Love it! Aw! Super cute lol. I love seeing pictures like that :D My kids didn't dive into their cakes :S My son actually ate his with a fork for his first birthday and my daughter didnt really want it. Those pics are GREAT! Love them! What a cutie! ur daughter and the cake are delightful!!! i love the smears on her face. it's the best part of a 1st bday party! LOL...Outstanding day, and great shots!! I love your photos! and birthday cakes are the best! Very cute. that is the most awesome 1st birthday cake ever! And it looks so good on her! Adorable photos! She certainly enjoyed that cake! That is SUCH a milestone! How adorable (I ADORE that last shot)! Wow, it looks like she loved the cake!! Oh man - she sure did make mince meat out of that didn't she?! LOL. Happy Birthday little princess! That's what birthdays are all about..."the cake"...She's ADORABLE! The 3rd photo and the last one are just too cute!! It was a beautiful cake too! Those pics are awesome - exactly how a cake should be eaten. Love it!! P.S. I'm seeing cake everywhere - and starting to get chocolate cravings - lol! How fun ... she CLEARLY enjoyed it all! Looks like the cake was a smashing sticking success! Aww, she's sooo cute! Looks like she definitely had a great time, love her big smile and the cake everywhere :). I just love the messy cute face. Hope she had a great day. been there. done that. glad they can feed themselves now! love that pink icing tho! That cake is so cute! Did you decorate it yourself? She does look like she enjoyed herself! What great photos! 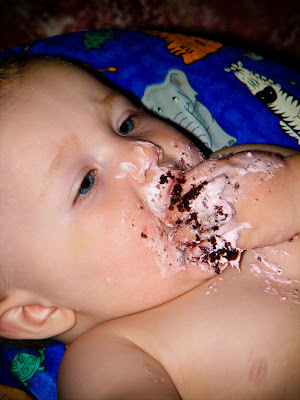 Every one year old should be able to get messy with cake!